Climate change has become one of the world’s most pressing challenges, with wide ranging implications for every aspect of life. In particular, the agriculture sector is likely to be severely affected by climate change. There are both direct and indirect effects of climate change on agriculture, according to the United Nations’ Food and Agricultural Organisation (FAO). These can include “floods, droughts, geographical redistribution of pests and diseases”. Climate change introduces variability into rainfall patterns and other aspects of climate, leading to uncertainty for farmers. Within the Indian context, agriculture is the largest employer in the country, with farm and non-farm allied livelihoods accounting over 50 percent of the workforce. Thus, climate change could impact the food and economic security of millions of people, making it a grave challenge to the nation’s future. The Economic Survey of India estimates that India already loses $ 9 to 10 billion due to extreme weather events; a figure which could rise further in the future. The impacts due to these risks are many, affecting social groups and farmer categories differently and increasing their vulnerability to changing weather patterns. The key impact seen in agriculture is increased incidence of pests and diseases, impaired growth and productivity of crops, heat stress in livestock, sudden disease outbreaks in livestock etc. There is no aspect of farming which is devoid of weather impacts, thus creating problems for the farming communities and their livelihoods. It is imperative therefore that steps are taken to make Indian farmers more resilient or capable of dealing with uncertainties in agriculture like drought, sudden high-intensity rainfall, increasing temperatures, unseasonal rainfall, and reduced precipitation. One such step is the agromet system or agro-advisories system developed by WOTR which provides weather advisories in 3 states: Maharashtra, Madhya Pradesh and Telangana. 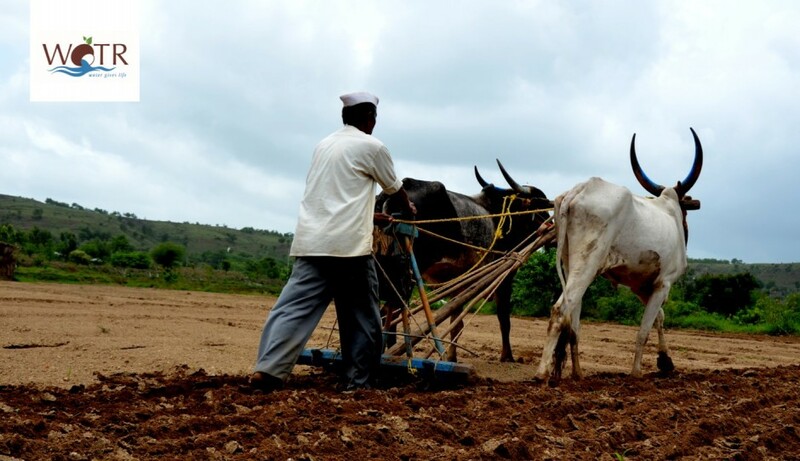 In this blog, we take a look at the impact of agro-advisories in some villages of Telangana. The provision of effective climate predictions and weather forecast along with advisories that help farmers in informed decision making is one of the solutions given by WOTR to climate variability. Providing weather information on a daily basis and updates on upcoming extreme events helps farmers manage the risks associated with climate change and weather. It also reduces input costs and losses. The farmers in the villages of Kamsanpally and Perapallathanda, of Mahbubnagar district of Telangana, have found advisories useful to them. Although the villages receive an average rainfall annually of 605mm, farmers still face problems in tackling climate-related risk in crop and livestock production irrespective of the cropping season. Many times farmers end up investing heavily in crop inputs (such as fertilizers and pesticides) to reduce crop loss which is often suggested by the local suppliers. This investment, generally does not yield positive results. Lack of information on the unforeseen weather events and quick low-cost solutions and inputs on how to manage these risks is a huge gap – where agro-advisories sent by WOTR are able to make a difference. Considering such conditions at the farm level, a two-stage intervention was taken up by WOTR as part of the KfW – Soil Project “ Integration of Watershed Development for Rehabilitation of Degraded Soils and Climate Change Adaptation” funded by the National Bank for Agriculture and Rural Development and KfW, the German-government owned development bank. As part of the project, an automated weather station was installed in 2017 in Kamsanpally . This system collects local weather details on an hourly basis which is then collated to generate a three-day forecast. Farmers are sent a daily weather forecast through SMS in the local language (Telugu) from WOTR’s agro-advisory software. WOTR’s weather data software and the data collection and processing system is linked to the Indian Meteorological Department (IMD), thereby making it authentic. The messages consist of information on daily rainfall, temperature, wind speed, and humidity – which is provided for three consecutive days. Further, farmers are also given extreme weather event warnings two days prior to the expected time of the event and which may have a potential impact on the standing and harvested crop as well as manage emergency situations. Farmers of both the villages appreciated the value of these forecasts. A few farmers reported that following the daily weather forecasts saved them from losing their crops . As they have information of the rainfall that to be received in the region the crops produce was harvested in advance. Thus, farmers were able to save the yield loss due to unforeseen weather conditions. Another set of farmers shared that, with the intimation of heavy winds (wind speed and direction) through the SMS, benefited them a lot as they were able to postpone the fertilizer application, saving them a huge loss. Further, the weather warnings are also serving the farmer a great deal in protecting their harvests from the thunderstorms and dusty winds which are seen in rabi and summer cropping seasons. One farmer commented that WOTR’s weather advisory proved useful in saving his crops from damage. The weather forecast received from WOTR on June 21, 2018 gave forecast of heavy rains for next three days. The local weather station installed in Kamsanpally has predicted heavy rains (6.7 -16.6mm) from June 21 to 23, 2018. This turned out to be true. Farmers, having received the advisory from WOTR, could save their crop from damage. This also explains the importance of data collection at the local/village level to meet the challenges raising from weather variations at high resolution. With the recent climate changes, there is an observed difference in local weather within a few kilometers. To capture such changes, having weather stations at village level helps us make more accurate weather predictions. In addition, in 2018 WOTR has also initiated providing agro-advisories services to 250 farmers twice a week. Through this, farmers are given information on the treatments and application they can follow to reduce the likelihood of disease and pest attacks to their crops. The advisories are sent in Telugu, the local language, and are generated based on real-time information collected from the field. So, advisories are being generated and sent to farmers based on the crop stage, pest or disease attacks that the crops of the specific region face as well as considering the weather condition of that particular day/week. Speaking about the benefits of these services, Reddy Nayak, another farmer in Perapallathanda shared that his paddy crop was saved during sudden summer rains because of the advisories he received in the summer of 2018. He said, “Generally, sudden heavy rains in the summer meant that there was a lot of standing water in my field. I removed the excess water from the field as soon as I received this advisory on my phone. It saved my crop from damage”. Standing water in the agriculture fields is a major problem during the monsoon season. Further, untimely rains can completely damage the crop leading loss in crop yields. A higher than optimum percentage of soil moisture damages the crop. It creates space for new pests and diseases to grow in the field, which can damage the standing crop, especially in the flowering or fruiting stage. Farmers of Kamsanpally and Perapallathanda villages are now adept in reading the weather data received in the form of SMS; a few of them are also taking inputs from the agro-advisories. Most farmers do have a mobile phone but in general they don’t check the SMS they receive. Thus, they miss out on important information such as weather updates/alerts. Thus, WOTR realised the need to create more awareness and update the farmers more regularly. Hence, WOTR came up with a concept known as Farmer Field Schools (FFS). The FFS is a platform where WOTR brings in farmers together to discuss, teach, learn and practice climate smart agriculture practices to and from farmers. It encourages farmers to learn from each other and motivates them to adopt climate resilient agriculture. These are held at village level, and have a mix of both male and female farmers. Women only FFS are also held to encourage participation of female farmers. The aim of these FFS is to create more awareness on the advantages of locally generated weather advisories and alerts, and the ways in which they help in saving the crop from damage or saving agriculture produce even when unforeseen weather events occur. It can be said that FFS and agro-advisories go hand in hand in building resilience in farmers. Thus, advisories can help farmers take informed decisions which will allow them to save their crops, yields thus boosting their income ultimately. Agro-advisories are therefore a core part of WOTR’s climate resilient agriculture approach. They have the potential to be scaled up to different parts of India and other parts of the world with similar conditions, with suitable modifications for local conditions and problems.